Explore in greater luxury with a 2-or 3-Category Suite Upgrade on select voyages acrossAsia, Australia, New Zealand andthe South Pacific—plus an additional $250 ShipboardCredit per suite. Upgrade to a Concierge Suite to enjoy benefits like a FREE 1-Night Pre-Cruise HotelPackage and priority, online shore excursion and dining reservations. Upgrade to aPenthouse Suitefor the personalized services of an attentive butler, daily canapés andall the amenities of a Concierge Suite. In addition to enjoying our hallmark inclusion of FREE Unlimited Shore Excursions, you can apply your Shipboard Credit Pre-Cruise toward a variety of unique Regent Choice Shore Excursions like a helicopter adventureof Kauai, Hawaii or a taiji (tai chi) Wellness Tour introducing you to the benefits of this“meditation in motion” in Bangkok, Thailand. In addition, on 11 voyages, enjoy an enriching FREE Pre-or Post-Cruise Land Program that will reveal both the highlights and hidden treasures of these mystical lands for a beautiful prelude or grand finale to your voyage. 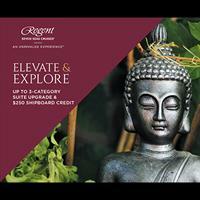 Enjoy an unforgettable journey when you take advantage of this incredible offer with Regent Seven Seas Cruises®, where every luxury is included, and every journey is anunrivaled experience.